Mike's prior release "Out of the Darkness" available now featuring a fabulous line-up of RestlessSouls! National Reviewer Keith "Muzikman" Hannaleck called it an Americana Gem! 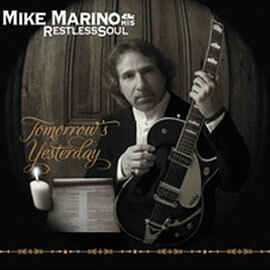 Muzik Reviews: Mike Marino and His RestlessSoul Releases Folk-Americana Gem "Out Of The Darkness"
"The Vocals & melodies have a nice Country, Folk-Rock style comparable to The Byrds, Eagles etc. - Love the arrangement, guitar chops & great lyrics!" Thanks to Boy Wonder Andre' Coles- WXPN - World Cafe' Live - Philadelphia for hosting PSP - playing there was a blast! I will be back later this year. Thanks very much to Mike Volpe "The Music Man" & Norm Donahue from WVLT Cruisin' 92.1 FM for featuring Mike on their Radio Show!- Mike was interviewed & played several originals & some covers live. The show was recorded so if you missed it you can check out some of it posted now on the Radio/Links Page! New Album Release - Tomorrow's Yesterday! Honored to Announce the Line Up of outstanding musicians & vocalists for this Album. These folks are all the cream of the crop from the Tri-State Region & I'm thrilled to feature their talents. Drums: Don Plowman - Don is back! Don's toured the world when he was the drummer for the US Navy Band & trained with Steve Smith- Journey in San Fran. & also spent time with the Virginia Symphony Pops- He's since become one of the premier sought after drummers in the region having played for Mike Dugan's Blues Mission & Don is currently touring with Craig Thatcher Band. Drums- Also handling Drum & Percussion duties -- Ron DiSilvestro -- Producer/Engineer Drummer extraordinaire - as mentioned above- it doesn't get better than Ronnie. Bass - Jim Hines -- Jim is back on the first three tracks we cut at Forge -- Outstanding Bass player - another Navy player who locks in with Don Plowman like they are one player! Pedal Steel & Dobro - Jimmy Heffernan - Jimmy's resume is just too long to touch - He's considered one of the finest Dobro/Resonator players in the country & has toured with numerous artists including Brad Paisley -He's played every stage from The Grand Ole Opry to The Tonight Show- Jimmy teaches Pedal Steel & Dobro in the US & Europe & spent several years in Nashville as a sought after session man. The man can play anything with strings! Piano & Hammond B3 - Carlo Dalessandro - Everybody's favorite Piano/Keyboard Player! Carlo has been entertaining audiences as an outstanding keyboard man for 40 years having played everything from Piano Bar at the AC Casinos to a founding member of South Jersey's beloved "That 70's Band"
Backing Vocals - Rachel Conrad - What a Voice! - 4 years of vocal training at Moravian College along with playing Piano, Guitar, Bass & Flute. But it was Rachel's Vocal that got her signed by John Anthony at Banner Records. Thrilled to have Rachel onboard! Backing Vocals - Mike Volpe - aka "Moe"! - Mike is another staple of the Philadelphia Music scene for over 40 years - A founding member of Abbey Road - The first Beatlemania & member of numerous other singing groups dating back to The Duprees & Stone Pony. Mike is now a Radio Host with his own show on WVLT 92.1 FM & was kind enough to feature me on the show! Violin/Fiddle - Alfiya Glow - Wow - this girl is just amazing - Alfiya Glow is her stage name born in Sochi Russia Alfiya won numerous International & National awards before gaining a full scholarship to Temple University's Boyer College of Music - Now a sought after session musician in Philadelphia & NYC. B3 & Mellotron - Brendan McGeehan - Producer, Arranger & Session player Brendan has toured up & down the east coast & currently is working with three Philly acts while teaching Audio Production at Forge recording. Great Ears think alike & when I mentioned Mellotron he even had that covered! Utility Guitars - Mark E. Johnson - My old partner in crime!-- I mean Duo Partner - Marks been a Full Time Guitar Instructor in both NJ & DE for over twenty years. An honors grad. from The LA Musicians Institute - Hollywood & also a Songwriter himself. Marks super tasty riffs are always fun to hear! Sharing Lead Guitar duties with me I'm proud to feature two of the Premier Lead men in the business - ANYWHERE -- but both happen to reside here in the Delaware Valley. Danny Eyer - South Jersey's sweetheart! - Danny is a monster Tele player whose done more sessions & tours then anyone I can think of - And when you hear his playing you'll know why... The list of people Danny's worked with looks like a who's who of Rock n Roll history -- Chuck Berry & Wilson Pickett to name just a couple - Another Nashville cat who even worked for Gibson Guitars down there. Mike Dugan - Bluesman Extraordinaire - Iron Mike Dugan as he's been called is a Tri-State Gem who was once awarded Bluesman of the Year by Show Business News in NYC. That award BTW was previously awarded to Mike Bloomfield, Roy Buchanan & Eric Clapton! What Danny is with a Tele this man is with a Les Paul - In fact Les Paul himself once compared Mike to Albert Collins. When he opened for CSN they embraced him. Mike is my mentor & his insight & advise is much appreciated! Backing Vocals - Bobby Campanell joining back in on Harmony Vocals - One of, if not the best male vocalist in the Tri-State Region Bobby has been entertaining audiences for over 40 years - A Co-Founder of the beloved band "The Shakes" he started with Vini "Mad Dog" Lopez of Springsteen's E-Street Band. The Shakes were the house band for The Stone Pony in the glory days of the mid 1970's - Bob took the stage many times with Bruce as well as opening for numerous major acts including Sam & Dave, The Monkees & Cheap Trick - A young man named Bon Jovi once opened for Bob & The Shakes & Jon has credited Bobby as one of his early influences. Welcome back Bob! - Stay Tuned for updates! 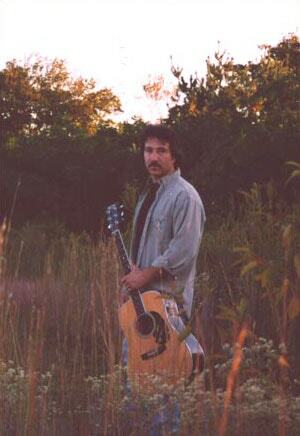 Mike just completed a complilation of Cover Songs recorded for a new Booking Demo for Solo Gigs. Check the Schedule Page for Clips of some of the Covers from Mikes Solo Covers Show. Just signed a contract with Amurco - A UK based Music Licensing Company for use of several songs for the European & Asian markets. "'Out of the Darkness' is a refreshing collection of modern folk/easy listening tunes. Vocally, Mike is captivating and has somewhat of an oldies vibe that boasts cross-generational appeal! Fans of country/folk rock will enjoy this work of art!" "The track we believe will get you the most airplay is "Out of the Darkness". It's the track most suited for radio airplay and should crossover into several different radio formats. Lyrically and vocally it's one of the best on the CD. Very melodic. Loved the arrangement. The song has a cool Traveling Wilburys vibe. We also considered Here Today, Stuck Out in the Rains, & Ulterior Motives." Regarding "Last of the Heartland" -- Kausing noted: "This CD reminded me of The Band. The vocals at times were reminiscent to the late/great Rick Danko and the Roots Rock Instrumentation were great!" "These are the words of poet/sage with a guitar; like a combination of CSNY and Lou Reed, heartfelt and to the point with a real world edge to it all. As indicated by the credits on this CD, Marino is D.I.Y. kind of guy and a literal one-man musical machine. He gets a little help from his friends, although the many talents he commands are his greatest advantage with this project. The combination of Rock, Blues, Americana, Roots & Poetry are an effective vehicle for making his point known & clearly understood, in the end the mission is accomplished and that is a victory for Mike Marino and the listener." "Mike Marino & his RestlessSoul's 2001 release, 'Last of the Heartland', is an album that spans time, space and stylistic influences. Marino has successfully re-invented a sound that evaporated from the pop culture radar more than two decades ago. By combining elements of acoustic folk, blues and electric rock, Marino revisits the sound and style of some of the best recorded music ever made. Mike Marino & his RestlessSoul's 'Last of the Heartland' is a record that lyrically and stylistically recalls a time in America when things were very different than they are today. The irony is that the recycled style and stripped down production sound astonishingly fresh in these days of supergloss teenage pop stars and hip-hop sample heads." Not as somber as Dylan, but not near as delighted as Christian, this 16 track tale of folk is able to find the lite rock mold that Clapton explored for a lifetime. The outrospective 'Lonely Town' exposes the mysteries and miseries of a televised society that finds loneliness as much a norm as pavement nowadays. 'Everybody's movin' too fast anymore / We should get together more like before / Everybody's watchin' bad news on tv / Where's it gonna lead to for you and me.' Hard to say, but Marlene Howell's backing vocals lend a nicety to a subject we all know and care to ignore. Very vocal album. Not enough room in the cd booklet to type everything in. A shame because one of the best vocal performances is 'It Just Ain't Fair,' and I'd like to type in some of those words. Rather reminiscent of Dylan and blues-chosen Springsteen, with some great black-washed guitar coming through the holes in the rap. The playing sits on the top shelf, never dusty, crying out with a western edge that's easy to grow into. Never mocking, always genuine: an easy coolness in a dry and self-deceptive planet." "Nice country-folk sound, a tad like Eric Clapton gone country"
Mike Marino is now getting airplay around the world from Melbourne Australia to West Virginia thanks to Acoustic Rainbow & requests for CD's are still coming in from many stations in the states! "Very solid production, with an intensive voice and powerfully played. Our listeners favorite tracks so far are #4, #10, & #15"
"Received your CD the other day... Thoroughly enjoyable and well suited for several of our programs"